Almotech Ltd was formed in November 2007, when Almotech Ireland formed a partnership with US company AMI Entertainment. Established in Galway by Vivian Dooley and Patrick O’Connor, Almotech Ireland had been operating since 1996 and grew to be a mainstream supplier of jukeboxes and other entertainment equipment to pubs, clubs and leisure outlets. In 2004, Almotech Ireland launched its own digital jukebox ‘The Mystro’. The success of the product captured the attention of AMI Entertainment, a major provider of software for digital jukeboxes. Following its formation, Almotech Ltd has designed an online, touchscreen digital jukebox. The jukebox uses AMI software and networking services to provide content from the Almotech server. 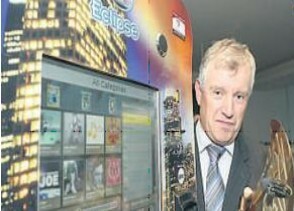 ‘The Eclipse’ jukebox was unveiled at the Amusement Trades Exhibition in London in January 2008 and was shown to Irish customers at AMEX 2008 and Hospitality Expo 2008, where it won the ‘Best Entertainment’ award. The product has now been launched on the commercial market. Over the next three to five years Almotech Ltd plans to expand its European operations, appointing sales executives for the UK, Spain, France and Italy. It also plans to sell 375 jukeboxes over the next year and projected turnover for 2009 is €1.4m, rising to €7.6m over the next five years.